Amidst disturbing chatter about the integrity of the February 16 presidential elections, how are citizens to have confidence in the process and its outcomes? For 2019, INEC accredited 144 observer groups, 56 more than were accredited in 2015. This increase represents heightened curiosity amongst local and international groups in the conduct of the elections following attention-grabbing incidents in the life of the Buhari administration. Recently, such incidents have included agitated skepticism by presidential aides over the interest of foreign governments in the elections. Their concern is not unfounded: Election observers, more often than not, mold public perception on the outcome of polls in Nigeria and Africa generally. One of such accredited observers this year is Justice Development and Peace Commission (JDPC), an organ of the Catholic Church in Nigeria. Fr Raymond Anoliefo, director of the group’s Lagos chapter, tells me his organisation will deploy about 477 observers to report on the presidential elections in Lagos state. These observers will cover all local government areas in the state, combining a pen-and-paper system with an election reporting app developed by JDPC to provide near real-time updates on the election. The Lagos data feeds a database in Abuja collated from JDPC chapters across the 56 Catholic dioceses in the country. These reports inform the official position taken by the Catholic Bishops Conference of Nigeria (CBCN) on the elections. JDPC was part of a coalition of observer groups (under the umbrella ‘Transition Monitoring Group’) that deployed Parallel Vote Tabulation (PVT) as its election observation system in 2011 and 2015. 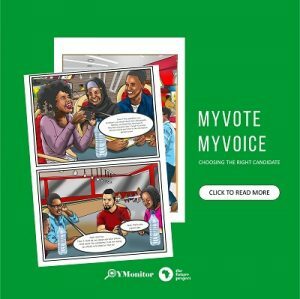 Ahead of the 2019 polls, another observer group – Youth Initiative for Advocacy, Growth & Advancement (YIAGA) – aims to make PVT more mainstream in Nigerian elections. Cynthia Mbamalu, YIAGA’s director of Watching the Vote, tells me their inspiration for observing election flows from “the fundamental human right of every citizen to participate in government” and that “observation is a sacred process that will help guarantee that citizens’ votes will count in elections”. To increase effectiveness in observation, YIAGA introduced the PVT model for observing elections during the Ondo state governorship elections in 2016. Since then, they have used it for four other governorship elections in Anambra, Ekiti and Osun states. PVT works by drawing a sample from the total number of polling units under observation – 176,996, for the 2019 presidential polls. To ensure national representativeness, without bias towards urban areas or imbalance in terms of geo-political zones, this sample is generated using a computerized system of stratification and randomization. “Our sample is representative of the whole” Mbamalu explains, “if Abuja has 5% of the polling units in Nigeria, our observers in Abuja will make up 5% of our sample”. Covering a total of 1515 polling units, YIAGA enlists 3898 observers for the 2019 elections. While 828 will roam all 774 local government areas as mobile observers reporting critical incidents, 3070 will be stationed at polling units, two per unit. Each observer (and every other member of the YIAGA observation team) signs a pledge of neutrality and non-partisanship necessary for performing their Election Day duties. Observers, mobile and stationery, use a checklist and tally sheet to record information about election process and results at each polling unit. The recorded data is sent to the Watching the Vote central database in Abuja via encoded mobile messaging, according to Mbamalu. Observers send their first batch of observations to the database from 8am on Election Day. By 10am, the Abuja team beings to share analysis on when polls opened across the country, arrival of sensitive materials, presence of INEC officials, security and number of female officials deployed by INEC. From noon, YIAGA sends out mid-day statements, a series of updates on voting presence, the state of card readers functionality and other issues such as voter intimidation at polling stations. They will share their reports using infographics on social as well as traditional media, in partnership with stations like Channels TV. Final statements on the elections are scheduled for Sunday morning, disaggregating results by states and geo-political zones. Due to its dependence on statistics and computerization, PVT has a reputation for reporting a reasonably accurate account of an election. First deployed in the Philippines in 1986, it has been used in African countries like Sierra Leone (2007), Malawi, Zimbabwe, Ghana (all in 2008), in Kenya’s 2010 constitutional referendum and in Zambia (2011). Adedeji Ademefun, an election observer with Action Aid Nigeria, wrote about the use of the PVT in 2011 and 2015 for his Masters Degree dissertation at the University of Ibadan. His research, based on 370 respondents who worked as PVT observers in both elections, showed a level of acceptance of the model’s value in observing elections. “PVT engenders electoral integrity on electoral process and outcome on election day” Ademefun tells me. Even if he believes “sensitization cannot be enough” when it comes to making citizens more aware of the efficacy of the model, he is confident that the large extent to which the model mirrors the actual results as finally announced by INEC shows it will gain acceptance. Ademefun warns, however, that while using PVT can engender a credible electoral process, it is not a guarantee for free, fair outcomes. “The main challenge is more the credibility observers have and how to create that credibility” says Charles Abani, a development practitioner overseeing a USAID project in Nigeria. “In 2015, I think a lot of the statements of international observers played a significant role in the president being able to say: yes these are free and fair elections”. He shared his views with me after a presentation at Social Media Week Lagos 2019 where the media and intelligence company, Stears, announced plans for an online Election Centre. The website will feature election results in near real-time as they are announced by INEC, based on Stears’s collaboration with election observers verifying the process on the ground. For incident reports, they hope to use proprietary chat bots that will pick up tweets about election malpractices. The tweets, after they are verified, create a heat map of incidents that give an idea of the integrity of the election process. An obvious concern with a Twitter-based data collection system is the strong possibility an unrepresentative sample. Michael Famoroti, partner at Stears and Editor-in-chief of its news website, acknowledges the deficiency but explains that the map will represent incidents as documented from Twitter alone. In that case, YIAGA’s more on-the-ground observation system fills in, providing citizens a broader perspective on the process. Emphasizing the focus on process as well as outcome, Mbamalu is adamant that YIAGA “will not verify results from a flawed process”. Also, “if INEC’s result falls outside our margin of error, we cannot verify”. For the citizen, it can only be a good thing that these organisations are ready to watch the vote. With the election companion tools available now, ranging from web applications and chat bots comparing candidates manifestoes, to tools for fact-check, for reporting incidents and for viewing results in real-time, there has not been a better time to be an informed voter. Previous article#2019Election: A critical look at the 2019 elections, would the figures matter?